Need more information about booking Home 5400880 ? An old typical Dalmatian stone house was reconstructed into a nice comfortable and modern guesthouse. The position is perfect, only some meters from the small harbor, 2 min. to the first sandy beach and to the center of the island, but in a calm little side street. You just need your bath dress and a towel, some meters to go and you jump into the sea. 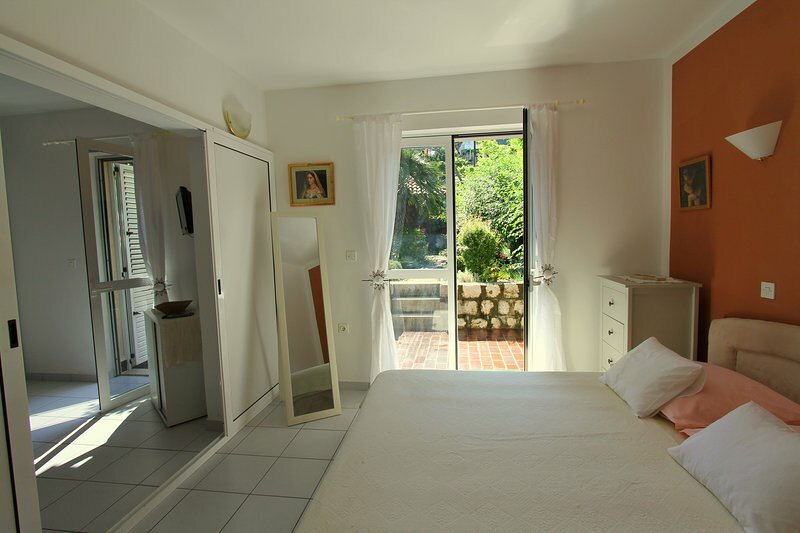 In this apartment with own garden and garden pavilion you have 1 sleeping- and 1 living room, a kitchen and bathroom, further SAT TV and air condition. The couch in the living room can be a single or double bed, so this apartment has space for 2 or 4 persons. On request we serve your breakfast on our restaurant terrace with a spectacular view on the bay of Lopud. We organize your private transfer from the airport Dubrovnik to the island Lopud. Kids are welcome in our house. We prepared toys and tools for the beach free to take, kinder beds available (for free). Smokers find a smoker bench near the house entrance. This is a quiet guesthouse on an romantic island, not suitable for party makers. You can get in touch with Gabriela (the owner) through the contact form on this page. Send Gabriela (the owner) an email through the contact form on this page. Alternatively, if there’s a phone number on this page, you can call them. How do I contact Gabriela (the owner)? If you’ve already booked, go to Manage your holiday booking to view Gabriela the owner's contact details or send them a message. Or send Gabriela (the owner) an enquiry through the Contact the owner/manager form if you’d like a quote or more info first. When you pay online through the Book your stay form, a booking request is sent to Gabriela (the owner). You’ll find out within 24 hours whether they’ve accepted - no money will leave your account before then. You can also request a quote from Gabriela (the owner) through the contact form. The owner will email you the total cost for your dates and a link to book and pay online. Use the Book your stay form to pay provisionally online. You can pay by credit/debit card or PayPal. Gabriela (the owner) will have 24 hours to accept the booking and no money will leave your account before then. Why can't I call Gabriela (the owner) before booking? You’ll need to contact Gabriela (the owner) to do this. Send them a message in Manage your holiday booking or through the contact form on this page. You can request to change the dates or number of people on your booking via the Manage your holiday booking page. To change your holiday dates use the Edit booking button. If you need to change the number of guests staying then send Gabriela (the owner) a message. If Gabriela (the owner) agrees, they’ll send you a revised quote outlining the changes. You can review and accept/decline this from the Manage your holiday booking page. You’ll have 48 hours to take action before the revised quote expires.